Supplementary material reads: "News Bureau, United Air Lines, Bill O'Hern, MAdison 6-6311, Night SUnset 1-0147. Story or caption info for inclosed [sic] raw neg. 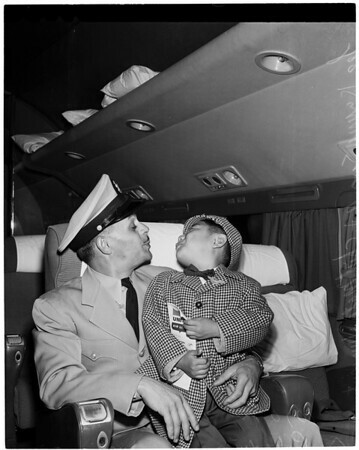 Holding on to his adopted father's Navy blouse, tiny Korean war orphan Lee Kyung Soo, 4, arrived at the Los Angeles International Airport late today, (Monday) from San Francisco aboard a United Air Lines plane to appear on a television show. His father, Chief Boatswain's Mate Vincent Paladino still showed the strain he has endured in bring [sic] the boy into the United States after finding him roaming around Navy messhalls [sic] in Inchon late in 1952. After much official red-tape Paladino was able to bring the child into the U.S. last week. Paladino, a veteran Navy man of 13 years, plans to take Lee to his parents home in New Rochelle, New York where he will join a ready made family of 32 grandparents, aunts, uncles and cousins."